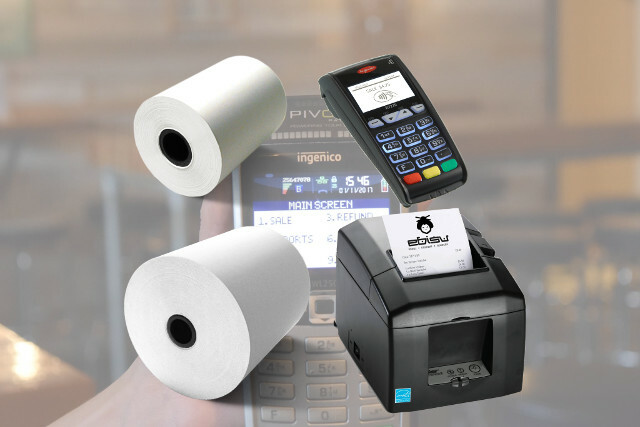 POS-n-go carries receipt printer paper and payment terminal paper to keep your business running efficiently. We have in stock 3 1/8" thermal receipt paper for all Star receipt printers. We also have bond paper and ink ribbons for kitchen impact printers such as the Star SP700. If you need 2 1/4" thermal paper for a debit/credit card payment terminal we've got that as well. The rolls fit Ingenico Telium and Verifone terminals. Pricing for boxes is considerably lower than the big box stores, and POS-n-go will ship it or have it available for pick-up the same business day that you place your order. To order receipt paper and other supplies existing clients can simply select the Order Supplies section in the secure web portal. POS-n-go has all your POS and payment terminal needs covered!